The 10-member South Korean delegation was greeted by North Korean officials after landing in Pyongyang, a spokesman for South Korea's presidential office said. Seoul: A South Korean delegation met North Korean leader Kim Jong Un on Monday, a South Korean official said, after arriving in the North on a visit aimed at encouraging North Korea and the United States to talk. Both North Korea and the United States have expressed a willingness to hold talks, but the U.S. position has been that they must be aimed at North Korea's denuclearization, something Pyongyang has rejected. North Korea, which has been developing nuclear-tipped missiles capable of reaching the United States, has vowed never to give up what it calls an essential deterrent against U.S. hostility. Pyongyang is also concerned about joint U.S.-South Korea military exercises, which it sees as preparations for war. South Korean officials have said the drills will restart next month as planned, after being postponed for the Winter Olympics held last month in South Korea. The Pentagon nevertheless said it was "cautiously optimistic" about the North-South talks, which resumed in January. "Our job is to make sure that we maintain those military operations to defend the Korean peninsula and we will (stand) shoulder to shoulder with our South Korean partners," Pentagon spokesman Colonel Robert Manning told reporters. "But we are cautiously optimistic and obviously we encourage the dialogue to take place," Manning added. 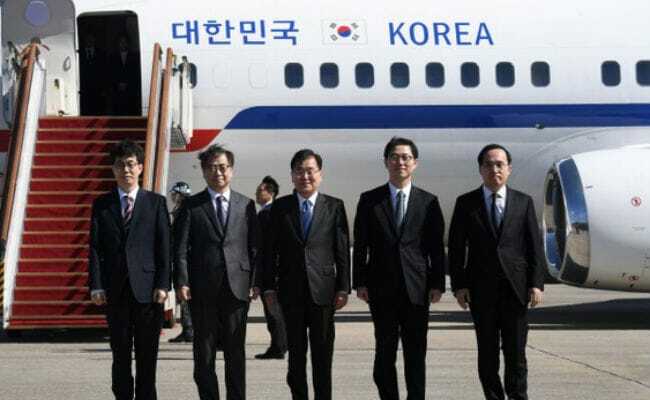 The 10-member South Korean delegation, led by National Security Office head Chung Eui-yong, was greeted by North Korean officials after landing in Pyongyang, said Kim Eui-kyeom, a spokesman for South Korea's presidential office. The welcoming delegation included Ri Son Gwon, chairman of the Committee for the Peaceful Reunification of the Country, and Kim Yong Chol, who heads the United Front Department, the North Korean office responsible for handling inter-Korean affairs. Both visited South Korea during the Olympics. The South Korean delegation was later invited to join Kim Jong Un for dinner, the South Korean spokesman added. The officials are the most senior South Koreans to meet Kim Jong Un since he took power in late 2011. "We will deliver President Moon Jae-in's wish to bring about denuclearisation of the Korean peninsula and permanent peace by extending the goodwill and better inter-Korean relations created by the Pyeongchang Winter Olympics," Chung said before heading to the North. Chung's team includes National Intelligence Service chief Suh Hoon and Vice Unification Minister Chun Hae-sung. Seoul hopes the visit will create "a positive atmosphere", Unification Ministry spokesman Baik Tae-hyun said. Chung and Suh are due to fly to Washington later in the week to brief U.S. officials on their discussions in the North. The White House and State Department did not respond to requests for comment. Thawing relations between the Koreas have prompted speculation about direct talks between Washington and Pyongyang despite months of tension and bellicose insults between U.S. President Donald Trump and Kim Jong Un that fuelled fears of war. North Korea has not carried out any weapons tests since late November, when it tested its largest intercontinental ballistic missile. Inter-Korean talks began after Kim Jong Un said in his New Year's address that he wanted to engage the South. North Korea later sent athletes to the Olympics, as well as a high-ranking delegation that included Kim's sister, Kim Yo Jong. Impoverished North Korea and the rich, democratic South and its U.S. ally have remained technically at war because their 1950-53 conflict ended in a truce, not a peace treaty. North Korea regularly threatens to destroy South Korea and the United States, which has 28,500 troops in the South, a legacy of the Korean War. North Korea's official Rodong Sinmun newspaper reiterated last month that the country would never give up its nuclear weapons, in spite of international pressure. "Neither sanctions nor provocations nor threats can ever undermine our position of a nuclear weapons state," it said. "Hoping that the DPRK would abandon its nuclear programmes is as foolish an act as trying to wish seas to get dried up," it said, referring to North Korea by its official name, the Democratic People's Republic of Korea.